Au revoir, Le Gros Bill. I have seen enough highlights to know that this world is losing not only an extremely talented hockey player, but one of the nicest, most respected men on the planet. 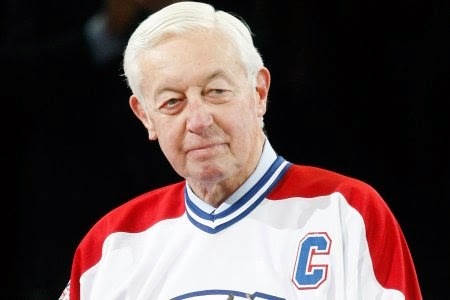 At no time have I ever heard anyone say anything negative about Jean Béliveau, and I'm pretty sure there would be about half a dozen Canadiens legends who still would drop the gloves if anyone said anything negative about one of Montreal's all-time greats. The world lost another great man on Tuesday night as Jean Béliveau passed away at the age of 83. Jean Béliveau's on-ice achievements are well-known. He was the fourth player to reach the 500-goal mark and only the second player to reach the 1000-point mark. Twice, he was named as the Hart Trophy recipient as the league's MVP in 1956 and 1964, he won an Art Ross Trophy as the league's top scorer once in 1956, and brought home the Conn Smythe Trophy as the playoff MVP in 1965. He won the Stanley Cup ten times as a player and another seven times an executive, giving him the most Stanley Cups by one individual to date. The 13-time NHL all-star was enshrined in the Hockey Hall of Fame in 1972 after finishing his career with 507 goals and 1219 points. He was a decorated man. "Like millions of hockey fans who followed the life and the career of Jean Beliveau, the Canadiens today mourn the passing of a man whose contribution to the development of our sport and our society was unmeasurable," team owner Geoff Molson said in a statement posted on the Canadiens' website. "Jean Beliveau was a great leader, a gentleman and arguably the greatest ambassador our game has ever known." Initially, his game was built on speed and skill. He would rarely respond to the goading of his opponents in a time where the NHL was much more brutal, and often would take punishment without a thought of retaliation, instead causing a pile of damage on the scoreboard than with his fists. However, his first Hart Trophy in 1956 saw him show why his imposing figure was to be feared as he lead the NHL with 47 goals, 41 assists, and led the Canadiens with 147 penalty minutes. The Canadiens would begin a streak of five-straight Stanley Cups that season, so it was evident that the Canadiens went as Le Gros Bill went. He was an exceptional player over his career on the ice as evidenced by the number of Stanley Cups the Canadiens won with Béliveau in the lineup. If there is a rink in heaven for players to go to, they just got one of the all-time greats. Rest in peace, Jean, and know that you'll always be remembered as a great man and a great hockey player in that order. Until next time, raise your sticks high in honor of Jean Béliveau!